Police secure the scene of a shooting at the building housing The Capital Gazette newspaper in Annapolis, Md. Online court records in Maryland show that three peace orders were taken out against Ramos — one each in 2011, 2012 and 2013. A judge can issue such protection, ordering someone to stay away from someone else and to avoid contacting them. In at least two instances, Ramos appealed the orders. It wasn’t clear whom the cases involved or what the ultimate outcomes were. 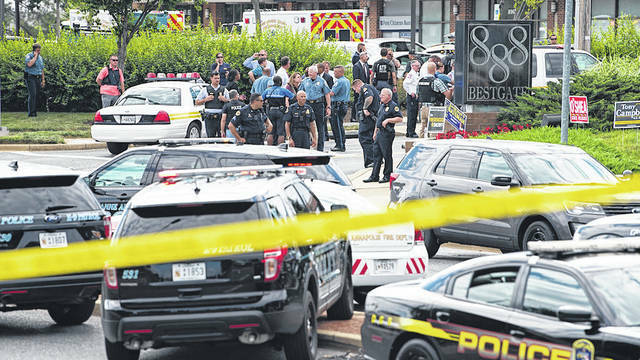 https://www.portsmouth-dailytimes.com/wp-content/uploads/sites/28/2018/06/web1_annapolis_ne2018629143257334.jpgPolice secure the scene of a shooting at the building housing The Capital Gazette newspaper in Annapolis, Md.